Whether you've lived on white carbs and trans fats all your life or you're already health conscious but want to clean up your diet even further, Eating Clean For Dummies, 2nd Edition explains in plain English exactly what it means to keep a clean-eating diet. Brought to you by a respected MD and licensed nutritionist, it sets the record straight on this lifestyle choice and includes recipes, the latest superfoods, tips and strategies for navigating the grocery store, advice on dining out, and practical guidance on becoming a clean eater for life. Clean eating is not another diet fad; it's used as a way of life to improve overall health, prevent disease, increase energy, and stabilize moods. Eating Clean For Dummies shows you how to stick to foods that are free of added sugars, hydrogenated fats, trans fats, and anything else that is unnatural or unnecessary. Plus, you'll find recipes to make scrumptious clean meals and treats, like whole grain scones, baked oatmeal, roasted cauliflower, caramelized onion apple pecan stuffing, butternut mac and cheese, and more. You are what you eat! 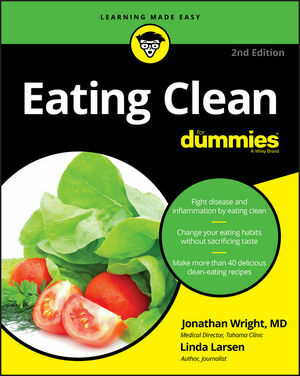 And Eating Clean For Dummies helps get you on the road to a healthier you. Dr. Jonathan Wright, internationally known for his books and medical articles, is a forerunner in research and application of natural treatments for healthy aging and illness. Linda Larsen is an author and journalist who has written 34 books, many of which are about food and nutrition.